This entry was posted on June 24, 2016 by Texas Safety Supply. Food industries over the globe have ever been increased in number as we evolved. As the variety in food processing increases, the tools and equipments also require an upgrade. The chefs, cooks and workers in food industries today does not only need cutting and chopping tools but also the gears that can protect them against hazards like burns, cuts and abrasions. Industries are competing with each other in this fast paced world and an active approach is needed to balance the faster food processing and safety. A worker in any food industry can only be able to do so with confidence when the protective gears like cut protection gloves, aprons, etc. are provided to them for daily usage. The market is filled with dozens of basic protection gloves and choosing the appropriate one seems difficult at times. In this post, we would try to help you understand the necessary things you should keep in mind while purchasing the cut protection gloves. It has been found that a large section of the realime workers who work in the food industries face hazardous situations like cuts, abrasions and burns. Hands naturally tend to protect the body at first place. Such accidents often demotivate the workers and bring down their productivity levels. Ensuring them a safe environment and providing the safety gears like cut protection gloves at least can help them work at their consistent efficiency. We won’t say that the people in the food processing industries face similar situations like construction and manufacturing industries but if overlooked, the injuries may happen to an extreme extent too. The cut protection gloves are constructed so as to take the impact of the situation for few seconds before the blade reaches the skin level. The human reflexes often works very well till then and thus, the accidents can be prevented. Cut resistance levels vary from level 1 to level 5. ANSI which is an american standard and EN 388 which is an european standards are the two well known global standards to confirm its authenticity. For the food industries, anything from level 2 to level 4 is appropriate. However, you can always go for the level 5 if needed. The fit, size and comfort matters and should be taken care while purchasing the cut protection gloves. Find if the palm is not too tight or loose but fit enough to offer a comfortable grip. Hold various tools and equipments to test the grip and functioning. In case of doubt, always refer to the manufacturer’s instruction. If your task is not heavy duty, you can always go down in cut protection levels. Ansell Hyflex 11-500 is one good example of gloves with adequate protections for low risk industries. Another is LX-5 Latex Coated Cut Level 4 Cut Resistant Gloves that are found very protective by the food industry workers. Materials such as polyethylene, latex, nitrile and vinyl are often used to construct the cut protection glove. While vinyl serves adequate for the kitchen purposes like cutting and chopping, latex offer the best dexterity. Polyethylene is the most affordable among all. 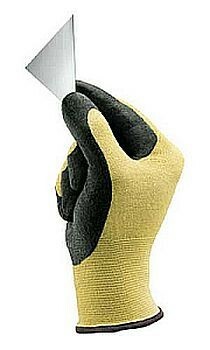 We at Texas Safety Supply always recommend to choose the gloves that offers the best protection levels.